Need to throw together a quick dashboard with live-updated information and statistical readouts? 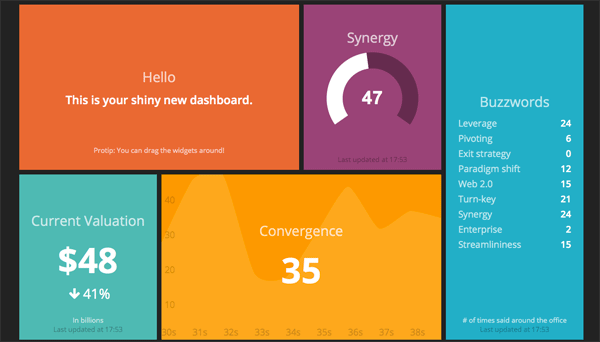 Dashing is a fun new framework built atop Sinatra that lets you quickly setup dashboards, much in the style of Microsoft’s “Metro” UI. You can leverage premade widgets (which include numerical readouts, meters, graphs and lists) or make your own with HTML, SCSS, CoffeeScript and a bit of Ruby. Dashing uses Batman.js and rufus-scheduler to run server-side jobs at scheduled intervals and update the browser. A live demo of Dashing can be seen here. I know I’m going to have a bit of fun setting up personal dashboards that pull in various fun statistics. There are already quite a few pre-made widgets out there, which should be helpful.